In addition to challenging healthcare leaders’ change management abilities, the value-based model also opens up new pathways for companies to have a greater impact on the populations they serve. Behavioral health companies in particular are better positioned to influence social determinants to health, such as housing, neighborhoods and education, which are no longer just a footnote in healthcare. Prevention and social determinants highlight a key business opportunity for America’s behavioral health industry. Countries like Switzerland and Australia have already capitalized on this area of need, spending more on social care than on healthcare. To place a greater emphasis on the impact of clinical care on health outcomes, more organizations need to follow suit by beginning to think about how to integrate social determinants to health into business processes. 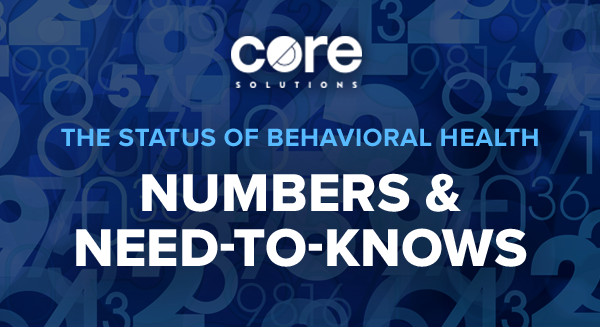 Let’s look at some of the most important numbers representing the status of the healthcare and behavioral health industries and discuss some of the other big changes that must happen to push these industries forward. The behavioral health industry’s total spend is growing an average of 5 to 6% per year. National Health Expenditures data shows that in 2012, America spent $2.7 trillion as a healthcare system and behavioral health represented about $200 billion. In 2016, we spent $3.2 trillion as a country on healthcare and $260 billion on behavioral health. By 2023, we may see healthcare spending beyond $5 trillion.1 Where does that leave behavioral health? It’s growing at a healthy average of 5 to 6 percent each year, which means our industry is growing and evolving and the work we do is very important to more and more people every year. However, the costliest medical problem are behavioral health disorders, at $200 billion. In 2013, the United States spent $200 billion on treating behavioral health disorders, which was significantly higher than spending for the treatment of other diseases and medical conditions, including heart conditions.2 An increase in education and prevention activities is what we can attribute to the reduction of heart conditions expenses. But it’s clear that behavioral health needs to find more effective ways of reducing the cost of services, treating more people and becoming more effective through new initiatives. About 35% of behavioral health funding comes from private insurance and self-pay. 35 percent of behavioral health funding comes from private insurance and self-pay, with the remaining coming from Medicare, Medicaid and other public sources.3 Using this 35 percent as a benchmark, many BH organizations will find their own percentages for private insurance and self-pay fairly low. This means that they are leaving the success of their businesses to the whims of external change more so than those that prioritize this area of funding to come closer to the benchmark. How does this compare to healthcare? There are about 5,500 hospitals across the country on which America spends around $1 trillion for hospital care. 20 percent of these hospitals are for profit and 80 percent are not-for-profit institutions. Whether for-profit or not, all organizations should aim for a healthy margin of 3 to 5 percent; without it, both industries will be unable to invest in any of the initiatives that will move them forward. The average revenue per healthcare professional is about $600,000. For behavioral health, it’s about $200,000. About five million healthcare professionals create an average annual revenue of $600,000 each to their organizations. One million behavioral health professionals providing a variety of services generate around $200,000 each, per year. To increase earning potential, BH needs to find new ways of raising these average revenues. One way of doing this is by improving several key business metrics in which behavioral health lags behind other specialty providers. A 30 percent average no-show or cancellation rate is typical in behavioral health, but this number drops to 5 percent in primary care. The average collection rate in behavioral health is anywhere from 80 to 90 percent. In primary care, it’s 96 percent. If more leaders in behavioral health can effectively address some of these very telling metrics, they open up opportunities to provide more services and build a better business. The number of behavioral health companies will shrink to about 6,000 in the near future. For most industries, it’s easy to point out the companies that are driving and defining the future of their space. Behavioral health doesn’t have these national leaders, but this only means that there is still room for a leader to step up and create a meaningful company that powers the industry’s growth. As they adapt to a transformative period, the number of behavioral health companies in the US is predicted to shrink to around 6,000. In order to be competitive in this environment, big decisions about long-term business goals will have to be made. Does your organization plan to be a part of the 6,000 as a successful independent business? Does your organization plan to be a collaborative part of the 6,000 by partnering and merging with others to get to scale? Blending businesses and their leaders is a healthy way of carrying out their common goal: serving people with mental illness, addiction and intellectual disabilities. What the behavioral health industry demands now is proactivity and planning to find what it is that each organization, each team and each professional can do best to create lasting, long-term value. Want more insights about the future of healthcare and behavioral health organizations? Request a demo of our EHR solution below to learn how our team is working toward a better future through technology solutions.